To follow the bands latest gigs click here. Big Mac’s were formed in 1990 as the house band for the legendary Hollywood Club in Newport. Within months of their formation The Commitments film was released and the band, being of a similar size and specializing too in 60’s Soul music, were inundated with work, constantly playing in every club, pub and eat house in South Wales. In a short time they were supporting The Commitments at a number of venues and were soon welcoming offers of work that took them to holiday camps, five star hotels and nightclubs both in the U.K. and abroad. The line up is that of tenor sax, trumpet and trombone, bass, drums, guitar, keyboards, two dynamic female vocalists and charismatic frontman Mike ‘Big Mac’ McNamara. Mike is a Soul singer in the purest sense of the word, thus the band, though more than adept at producing the raw edged originals of Wilson Pickett, Sam and Dave, Otis Redding and James Brown, are also proficient in the more polished spheres of black music, Motown, Philly, Funk and those glorious vocal harmony drenched ballads. Vocalists, however, are only as good as their backing band permits and Big Mac has The Wholly Soul Band… easily the best in the business. The band is fully self contained with lights, p.a., transport, road crew and a highly efficient sound engineer capable of gauging the needs and requirements of every audience, venue and event. To date Big Mac’s have appeared on the bill with a vast number of top names, from Edwin Starr, Jimmy James and The Vagabonds, Van Morrison, The Pasadenas and Jools Holland to Go West, Dodgy and Shed7. From its very beginning the band has been immensely popular, building a rock solid reputation. They are a firm favourite at weddings, festivals, corporate events and social gatherings where a first class, energetic and wholly infectious good time act is required . The British Variety Club, The Royal Institution of Chartered Surveyors, Eversheds, L’Oreal, The Showman’s Association, The Institute of Direct Marketing, David Lloyd, The Royal Mint, The Holiday Inns, Barclays Bank, Deloitte and Touche, Biomet Merck, Rimmel, Coca Cola, Smith -Kline- Beecham, Lloyds T.S.B., Macob, Johnson and Johnson, Masterfoods, British Hairdressers Association, R.N.L.I., S.W.A.L.E.C., Primary Care, The Equestrian Society, Freemason Lodges, Centre Parcs, Emergency Services, Arthritis Research, British Osteopath Society, Freeman’s Cigars, Admiral Insurance, Whitbread, Interbrew and many, many more. The band has played in countless pubs, clubs, nightclubs, country clubs, rowing clubs, golf clubs, health clubs, rugby and football clubs, colleges, castles, theatres, stately homes, universities, military summer balls and bashes, weddings and birthday parties, anniversary celebrations, gala dinners and charity functions, ad infinitum. They have appeared on a number of T.V. and radio slots, including voice overs for ads and performed a televised performance of two original songs for the Children in Need appeal. Big Mac’s have played the Royal Dublin Society in Ballsbridge Dublin, The SemiRamis and the Marriott Hotels in Cairo, Celle in Germany, The Coconut Grove in Las Americas, Tenerife and, in this country, The Cafe Royal, The Dorchester Hotel, The Royal Lancaster Hotel, The Cavern Club, Cardiff International Arena, Centre Parc, Butlins, Somerwest World, Drayton Manor, London’s Brewhouse, Metropole Hotel N.E.C., Five Lakes Hotel in Maldon, Caerphilly, Cardiff, Caldicot and Fonmon Castles, The Jamhouse, The Marquee Club, The Rock Gardens, Great Tithe Barn Tetbury, Ashton Court Mansion, Tredegar House Stately Home, and even Leyhill Open Prison! Innumerable festivals include Upton Blues, Monmouth, Ashburton Blues, Raglan, The Pink Moon and the legendary Brain’s Beer Festival in Cardiff Bay. 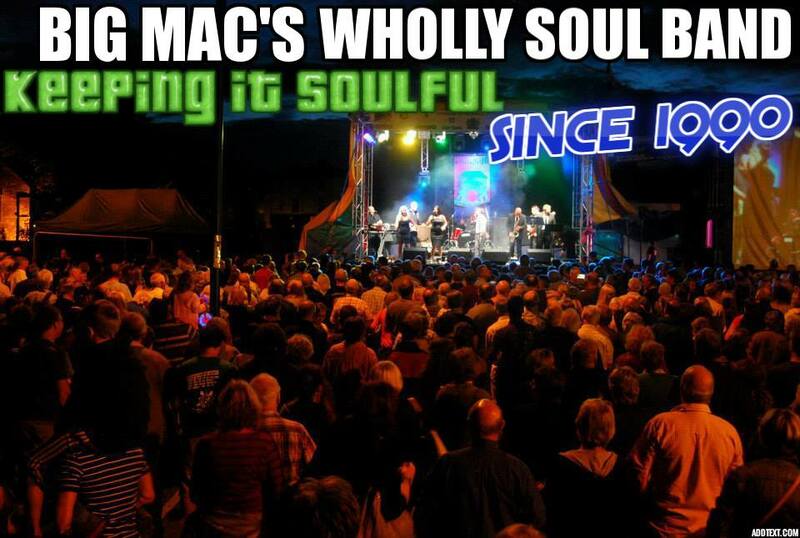 In their career so far the Mac’s have appeared with, in no particular order, Edwin Starr, Jimmy James and The Vagabonds, Van Morrison, Jools Holland, The Commitments, Go West, Limahl, The Pasadenas, Sweet, Bonnie Tyler, Mud, Captain Sensible, Marmalade, Mike Reid, Jim Bowen, Stan Boardman, Little and Large, Shed 7, Catherine Zeta Jones, Charlotte Church, Ian Botham, Dodgy, The Bay City Rollers, Jaki Graham, Gwen Dickey of Rolls Royce, Squeeze, Midge Ure, The Saw Doctors, Pato Banton, Mike Flowers’ Pops, Dave Dee, King Pleasure and the Biscuit Boys, Paul Lamb and The Kingsnakes and innumerable unforgettable celebrities we’ve momentarily forgotten! Please click on the album cover to follow the link to make your purchase. Live – Vol 1 – The Album ~ Buy Big Mac’s Wholly Soul Band Live Album – Volume 1. Priced at just £6.49 for 12 live tracks. Live – Vol.1 – Buy Individual Tracks ~ 12 tracks at just 69p each! Live – Vol 2 – The Album ~ Buy Big Mac’s Wholly Soul Band Live Album – Volume 2. Priced at just £6.49 for 13 live tracks. Live – Vol 2 – Buy Individual Tracks ~13 Tracks at just 69p per track! The band is self contained with its own 6K Logic rig, lights, vans, roadcrew and sound engineer. Big Mac’s are currently without management or sole representation.